Among existing cameras, I'm pretty happy with my current Konica-Minolta 7D / K-M 28–75mm ƒ/2.8 setup, despite the relatively alarming fact that the company beat a hasty exit from the camera biz last year. Reasons: results. I don't really care for the camera as an object or an operating experience—well, with the exception of the much-better-than-average viewfinder—but the results are just great. I'd have to know that a replacement could do at least as well in terms of color accuracy and tonal scale and practical features before I'd be willing to jump. And by the way, I think a large part of my satisfaction has to do with the lens, or the way this lens works with this camera. I bought a Sigma 30mm ƒ/1.4 for the 7D, and the results, while good, just didn't have quite the same richness of color, and there was a lot more CA in some situations. So it ain't entirely the camera that's good—it's the combo. Among postulated cameras, here's the crux of my dilemma: there's a sort of ordering of features that are important to me, each of which sort of rules out a large portion of the existing market. A good viewfinder. A viewfinder is just a pointing device. On a Speed Graphic, it's little circular eye-hole-peeper-thingy and a wire frame, a primitive system that works surprisingly well. Anyone coming to an entry-level DSLR from a digicam is going to be pleased by the nice big view, and entry-level DSLR viewfinders work perfectly adequately for pointing. There's no "problem" with any of them; they're good enough; the broad "market" in its tumblehome wisdom doesn't demand more, and I should humbly accede. But screw that. I want better, dammit. So the Sony Alpha A100 and the Pentax K100D are ruled out here. 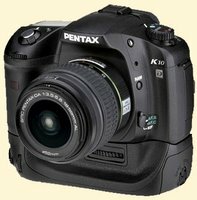 You'll not have failed to notice that this leave me all of one current option should I happen to be in the market to replace the 7D—the Pentax K10D. Which I have not yet even seen. Responsiveness. A crucial camera feature. ("Responsiveness" just means how fast the camera does what you tell it to, and, secondarily, how fast it does what it does, such as, say, autofocus in low light.) The 7D is adequate, but just barely. Nikon seems to be paying special attention to this. Sensor size. I'm partial to the APS-C, 1.5X crop, 24x15mm class of sensors. I find it is just about what I want for d.o.f. and pixel quality. And some of my favored lenses are APS-C only. So I would want a camera with this size sensor. Maybe in ten years, or fifteen, I'll have slowed down enough, and the cameras will have improved enough, that I'll be hankering after a "645"-size sensor. Not yet. The future? Well, it's astonishing that I'm already thinking of the 7D, which is the fifth or sixth most expensive camera I've ever bought, as disposable—but it is, and I am. (It's not exactly up to me.) But in two or three years I'll probably be looking at the K10D, the next Sony SLR that's upmarket of the A100—that's assuming Sony in its inscrutable mega-corporation fickleness decides to stay in the DSLR market—the Olympus "E-2," and any possible future Canikon that puts anti-shake in the body. And what, you might ask, of the "DMD"? A casualty of realism, alas: I've been in the photo biz for a few decades now, and I know that even if some manufacturer ever bites on this idea (what, a 10% possibility? ), the chances they'll get it right are maybe 5%. And I'm not going to waste my life worrying about something that has a .5% chance of ever existing. (Well, I probably am, actually, but I don't need to 'fess to that here). 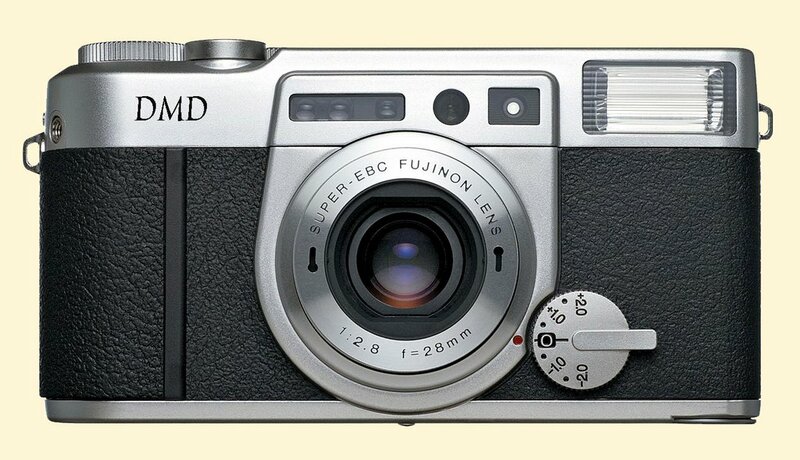 Dream cameras: they don't really exist any more. But we can always dream. I handled the K10D at Photokina and I have to say I liked it more than any other in its class I handled there. It seems just about right. And the pancake lenses seem wonderful as well, though I can't judge image quality through a viewfinder, obviously. The upcomming 16-50/2.8 could make it the perfect system for me and an awefull lot of camera for the money. Unless Olympus graces us with an "E-2" with the next year or two and that Leica 25/1.4 is ever for sale, Pentax may just have to be it. It seems to me that there is a DMD, and it's the Leica M8. Except, perhaps, for the lack of autofocus. Heck, it's even a lineal descendent of the original "DM" camera. Is there any reason you don't see it that way? "Is there any reason you don't see it that way?" My prelimiary reservation (and it's just a reservation) is cost. Naturally, cost brings up a whole interrelated welter of considerations that many people will balance in very individual ways. I mentioned in the post that my 7D is "disposable," which is perhaps too radical a word for a camera I'll probably keep for five years. But I think that in general it makes less sense with digital to buy a camera that costs 3X what standard tools cost, unless you can depreciate it, simply because the sensor and camera operability are so likely to become obsolete relatively quickly. I know, people say "if it's good enough for you now, it will always be just as good," but first of all it might not, because these things age, and second, in practice there are very few people lusting after digital cameras now that are two or three generations out of date. And of course it also depends on just how much disposable wealth you have--price is always relative. (I'm sure it was an inconsequential consideration for the pop star Seal when he bought his, for example.) But let's put it this way: as a general rule I hesitate to RECOMMEND cameras that are beyond a certain price level, just because the probability of the buyer having to take a loss rises so precipitously. Again, this is not an argument against the M8 per se, just a preliminary reservation. I'd really have to shoot with one for a while to make more definitive comments, something I doubt is going to happen any time soon. Mike, if everyone felt as you, all DSLRs would have anti-shake. I know you'd like to see that happen. I've never worked with it, but it sounds VERY useful. I read your DSLR must-haves, and the Nikon D200 admirably meets all of them except anti-shake: responsiveness, sensor size, good viewfinder, and even cost. 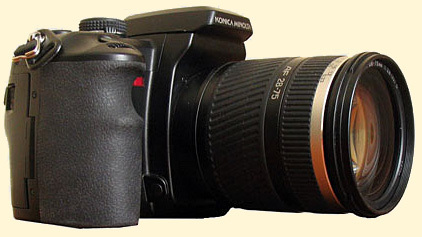 It sounds to me that your dream camera could be a Nikon D300, with anti-shake in the body. "It sounds to me that your dream camera could be a Nikon D300, with anti-shake in the body." I admire the Nikons very much, especially the D200 and D80. Nikon's cameras are shooter's cameras, with a balance tilted just a little more to the practical than some other brands. But even saying "that or that camera is the dream camera" these days is sort of odd, because I'm supposing that the days of using one camera all your life are basically over. I did an article not long ago about Pat Dalzell, who shoots with an ancient 4x5 and a lens that's older than she is, and I know a number of photographers who have worn out Leicas, which takes decades to do and still isn't that easy. I suspect the very nature of the technology of digital has made the concept of a "dream camera" or "final tool" (there's actually a German turntable called the "Final Tool"!) a moving target. It's possible to make educated guesses about the sideways and forwards skips and jumps that the technology may take in the foreseeable future, just not accurately--but whatever they will turn out to be, the fact that they are indeed coming seems inevitable. Just as no one could have foreseen today's inkjet printers in 1990 or 6MP cameras in the $500 range, tomorrow's technologies will bring along with them a whole set of natural "must have" features and capabilities. We just don't know what they are yet. But what all this means is that every "dream camera" is provisional, temporary, and exposed to being outmoded. I think that will continue to remain true, even if some cameras do hit the moving target for a time. Mike, maybe separate categories are in order such as "digital dream cameras," and "dream cameras," with the understanding that the DDC category is volatile. And everything you said rings true to me; in fact, my dream camera is an Olympus OM-4Ti. "in fact, my dream camera is an Olympus OM-4Ti"
That's an all-time favorite of mine, one I did some of my best work with. It appears that in-body anti-shake is soon to become as de rigeur as those other no-brainer technologies: autofocus and autoexposure. It's economically and technically viable, transparent, "just works" most of the time, and brings real and obvious benefits to both pros and consumers. When there are already $200 compacts with anti-shake, is there any excuse for the majors--including Canon--not to offer in-body antishake throughout their camera lines within the next two years? The writing's on the bandwagon. I believe you'll have some interesting choices, Mike, when you are ready to put down the 7D. However, my hope is that one or two players (most likely Fuji) will decide to compete, at least in the short term, by offering cleaner and higher ISO sensors and faster lenses, and keep working to push that end of the performance/cost envelope as well. That way we'd end up with the best of both sooner rather than later. What I would like more than anything on my next DSLR is a live flip-up LCD viewfinder. I've been shooting SLR's (and TLR's) exclusively for over 20 years. A year ago I picked up a $300 P&S so that I'd be able to always have a camera available. I can't tell you how much the flip-up LCD viewfinder has done for my shooting POV, and my neck! "tomorrow's technologies will bring along with them a whole set of natural "must have" features and capabilities. We just don't know what they are yet." Yes, that is important to keep in mind. It is amazing, after decades of mind-stretching, it still seems impossible to really imagine even just ten years ahead. I too was in love with the OM-4 when it came out, sadly I didn't have time or money for it then. I had an OM-2 later, it was a remarkable camera. I am sure more "lust-worthy" camera will come in the digital era, after sensor-development has stabilized. "What I would like more than anything on my next DSLR is a live flip-up LCD viewfinder"
I sure agree with you on that. Best thing about digicams IMHO. IT's surprisingly freeing not to have to have your head be where the camera is. The E-300 has this now, but not a lot of the other features I'd like to have. If my Sony DSC=R1 had anti shake it would be perfect. It already has a waist level finder, bigish sensor, and a fast, sharper than the sensor, Zeiss lens. "If my Sony DSC=R1 had anti shake"
As soon as it does, I will probably buy one. I've shot about a thousand frames now with the K10D. I've shot in low light with a 50mm lens at 1/4 second with good results. I've shot at ISO 1600 and seen minimal noise. Great camera. A super value at less than one K.
I agree with this also. I got the Nkon Coolpix 2400 for that reason, and it is wonderful. (Also has a wideangle zoom, 24mm eq.) Only thing is, it's noisy at high ISO, and the LCD screen should be bigger. I hope they will come up with a continuation of this series. My dream camera would use the 'no-focus' technology that was discussed a while back. In order to make it acceptable, the sensor would have to have about an order of magnitude more pixel density than is considered normal these days, so there are some technological hurdles. "As soon as it does, I will probably buy one." I was at the Sony booth at Photo Expo in NYC , and asked if Sony was going to follow up the DSC-R1 with anti shake. Half the guys in the Sony booth thought I was nuts, and the other half wanted a DSC-R2 too but thought it would never happen. My current dream camera (just because Sony hasn't announced any successor to the 7D yet) is the K10D. This assumes that the actual reviews play out as well as the current hype. In fantasy land I see myself being able to afford an M8, but I'd be very interested to see an updated RD-1 or digital ZI as well. Oh, is it? Or to put it the other way around: what is the foreseeable future? And then came auto-focus. Then came wireless flash control. Then came in-lens image stabilization. Then came digital imaging. Then came Photoshop. Then came EXIF data. Then came in-camera GPS positioning and wireless image transfer right from the camera. Then came in-body image stabilization. Who dares to predict what's coming next year ... and what's not?